What does error code -XXXXXXXXXX mean? In general, if BatchPatch generates an error code, it will also contain an error description right next to the error number. The description will explain (or attempt to explain) the error. However, many or most of the error codes that you see in BatchPatch are not technically BatchPatch error codes but are actually Windows error codes that BatchPatch captured or in the case of third-party application deployments, the error codes are generated by the third-party installers and displayed by BatchPatch when they are triggered. Most BatchPatch error codes will be either a 3 or 4 digit number, and as mentioned above will usually also come with some sort of error message or description. If an error code does not come with a message, then there’s a good chance it’s a Windows System error code. 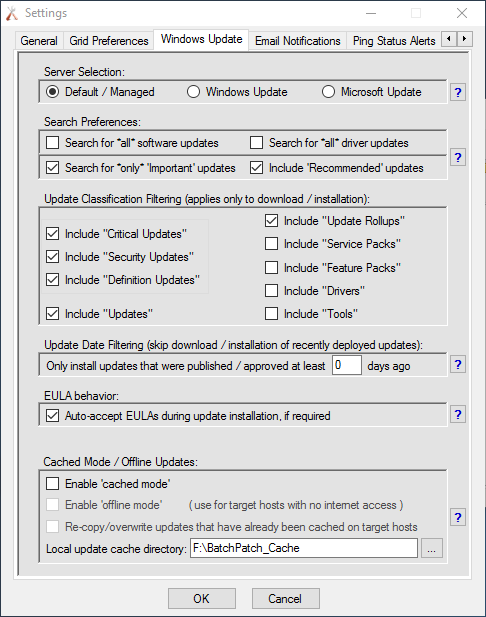 Why does my search for available updates at the Windows Update control panel GUI not report the same number of available updates that BatchPatch reports when I use it to check for available updates on the same target host? Reason 2: The second reason you might see a different number of available updates in BatchPatch is due to the search location (‘Server Selection’). Default / Managed: Uses the target computer’s existing configuration to determine where to search for updates. Microsoft’s public server. Includes only Windows updates. Microsoft’s public server. Includes Windows updates AND updates for other Microsoft products. Before using Microsoft Update, target servers must be opted-in to the service. If your search for updates in BatchPatch is not searching the same location as when you search for updates manually at the Windows Update control panel GUI, then you will not necessarily see identical results. In BatchPatch you can confirm the location that the target computer is configured to use by executing ‘Actions > Windows Updates > Get Windows Update configuration.’ This command simply retrieves the values of a couple of registry keys on the target computer to see if they have been set by Group Policy or Local Policy, and if so, to what values. Reason 3: It’s possible that what is appearing in the Windows Update GUI on the computer itself is not up to date. On newer Windows operating systems (i.e. Windows 10) this information is cached and can therefore become stale. Until the computer initiates a new search for updates to refresh what it is reporting, the search results it displays could contain out-of-date/inaccurate information. You might consider looking at the history of updates that have been installed on the computer to compare with what is being reported in the Windows Update GUI in order to confirm whether or not the Windows Update GUI is reporting accurate information. We have a posting that specifically addresses this topic here. Reason 4: Another reason for the discrepancy is if you’re using offline mode. Offline mode scans for security updates updates against the wsusscn2.cab file from Microsoft, which does not contain every update that is published on Microsoft’s public update servers. Reason 6: The target computer is configured via Group Policy to search for updates on a WSUS that is controlled by SCCM. A WSUS that is controlled by SCCM will never return any available updates when the target computer is scanned by BatchPatch. In order to use BatchPatch with a WSUS, the WSUS must be independent and cannot be linked to or controlled by SCCM. What are the port requirements for BatchPatch to run properly? Please visit https://batchpatch.com/batchpatch-ports for more on ports. I am trying to execute a software deployment, but it’s hanging indefinitely. What am I doing wrong? When you execute a remote software deployment you must incorporate the appropriate silent installation parameters. See Understanding and Discovering Silent Parameters for Software Deployments for more. Is it possible to run BatchPatch as a service so that the computer does not need to be logged-on in order to run scheduled tasks? Is it possible to execute multiple commands in sequence on a given host or set of host(s)? Yes! Please check out the Job Queue and the Advanced Multi-Row Queue Sequence tutorials. Is it possible to use BatchPatch to deploy Windows Updates to computers that do not have internet access and do not have access to a WSUS? BatchPatch.com - Windows Update & WSUS Patch Management Software and Tools. Copyright © 2011-2019 Cocobolo Software, LLC.